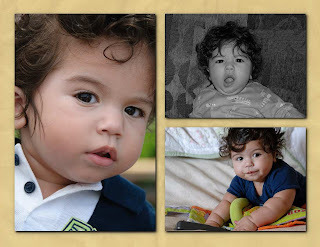 How about documenting your child's first year in a set of 12 images, one for each month. These can be framed in a large collage. They could also be used to print your own 2011 calendar. Want more images in a single collection? Layout and print a book of your favorite images of your child, family, or anything, for that matter. I strongly suggest a book of images from your child's first year. There are so many experiences and so much change in that first year, you'll be going back to these images for many years to come. Shooting images you plan to print will likely require some changes to the settings on the camera. The majority of people will set up their camera so the storage device holds the maximum number of images. This setting is also the one with the least amount of resolution and will severely limit your printing options. When the intent is to eventually print your images, you should set the camera for the highest quality resolution you can. This will result in fewer images per card, but much higher quality images. Making the books is very simple. Almost all the online photo sharing sites offer sort of book printing option with their lab services and there is a wealth of software available to help with layouts. Once you make your first one, you'll be doing many more. Don't stop with just the baby. These press printed photo books are quickly becoming the new "family photo album". The advantage to these is, relatives can't make off with the only remaining photo of Uncle Oliver that 9 of your other relatives claim belongs to them.